Each aircraft has a specific pitch attitude and airspeed that corresponds to the most efficient climb rate for a specified weight. The POH/AFM contains the speeds that produce the desired climb. These numbers are based on maximum gross weight. Pilots must be familiar with how the speeds vary with weight so they can compensate during flight. To enter a constant airspeed climb from cruise airspeed, slowly and smoothly apply aft elevator pressure in order to raise the yellow chevron (aircraft symbol) until the tip points to the desired degree of pitch. [Figure 7-63] Hold the aft control pressure and smoothly increase the power to the climb power setting. This increase in power may be initiated either prior to initiating the pitch change or after having established the desired pitch setting. Consult the POH/ AFM for specific climb power settings if anything other than a full power climb is desired. Pitch attitudes vary depending on the type of aircraft being flown. As airspeed decreases, control forces need to be increased in order to compensate for the additional elevator deflection required to maintain attitude. Utilize trim to eliminate any control pressures. By effectively using trim, the pilot is better able to maintain the desired pitch without constant attention. The pilot is thus able to devote more time to maintaining an effective scan of all instrumentation. The VSI should be utilized to monitor the performance of the aircraft. With a smooth pitch transition, the VSI tape should begin to show an immediate trend upward and stabilize on a rate of climb equivalent to the pitch and power setting being utilized. Depending on current weight and atmospheric conditions, this rate will be different. This requires the pilot to be knowledgeable of how weight and atmospheric conditions affect aircraft performance. 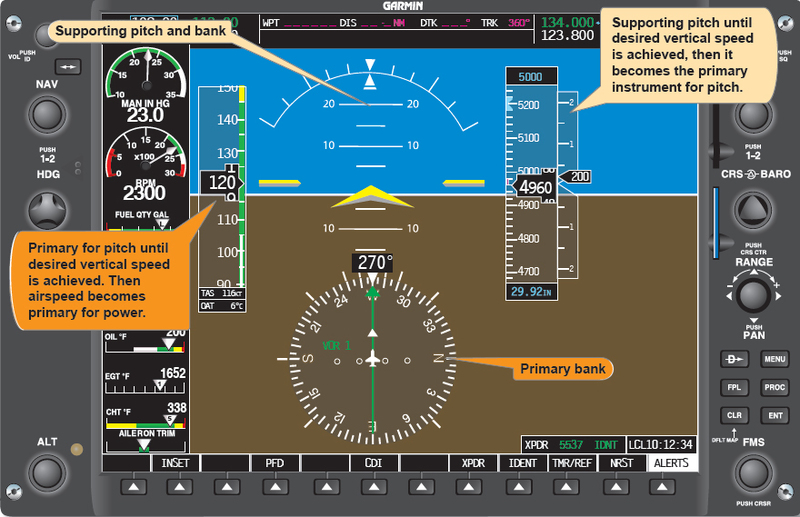 Once the aircraft is stabilized at a constant airspeed and pitch attitude, the primary flight instrument for pitch will be the ASI and the primary bank instrument will be the heading indicator. The primary power instrument will be the tachometer or the manifold pressure gauge depending on the aircraft type. If the pitch attitude is correct, the airspeed should slowly decrease to the desired speed. If there is any variation in airspeed, make small pitch changes until the aircraft is stabilized at the desired speed. Any change in airspeed requires a trim adjustment. In order to enter a constant airspeed climb, first complete the airspeed reduction from cruise airspeed to climb airspeed. Maintain straight-and-level flight as the airspeed is reduced. The entry to the climb is similar to the entry from cruise airspeed with the exception that the power must be increased when the pitch attitude is raised. [Figure 7-64] Power added after the pitch change shows a decrease in airspeed due to the increased drag encountered. Power added prior to a pitch change causes the airspeed to increase due to the excess thrust. When making changes to compensate for deviations in performance, pitch, and power, pilot inputs need to be coordinated to maintain a stable flight attitude. For instance, if the vertical speed is lower than desired but the airspeed is correct, an increase in pitch momentarily increases the vertical speed. However, the increased drag quickly starts to degrade the airspeed if no increase in power is made. A change to any one variable mandates a coordinated change in the other. Conversely, if the airspeed is low and the pitch is high, a reduction in the pitch attitude alone may solve the problem. Lower the nose of the aircraft very slightly to see if a power reduction is necessary. Being familiar with the pitch and power settings for the aircraft aids in achieving precise attitude instrument flying. Leveling off from a climb requires a reduction in the pitch prior to reaching the desired altitude. If no change in pitch is made until reaching the desired altitude, the momentum of the aircraft causes the aircraft to continue past the desired altitude throughout the transition to a level pitch attitude. The amount of lead to be applied depends on the vertical speed rate. A higher vertical speed requires a larger lead for level off. A good rule of thumb to utilize is to lead the level off by 10 percent of the vertical speed rate (1,000 fpm ÷ 10 = 100 feet lead). 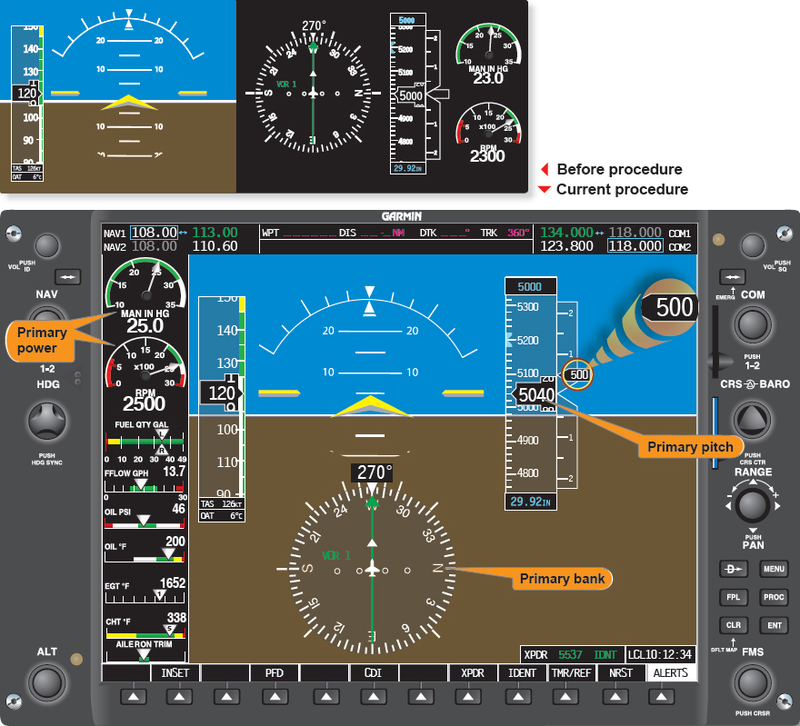 To level off at the desired altitude, refer to the attitude display and apply smooth forward elevator pressure toward the desired level pitch attitude while monitoring the VSI and altimeter tapes. The rates should start to slow and airspeed should begin to increase. Maintain the climb power setting until the airspeed approaches the desired cruise airspeed. 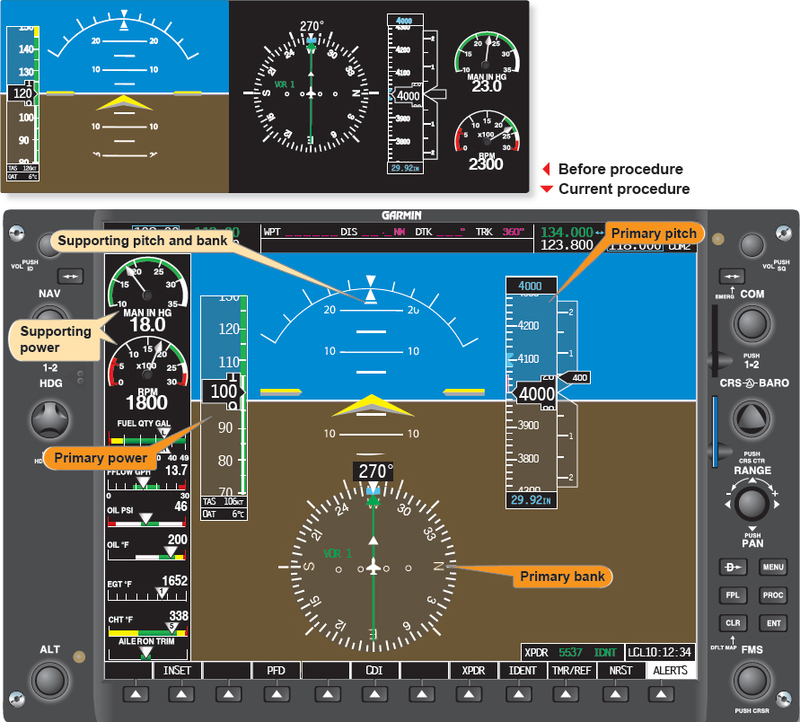 Continue to monitor the altimeter to maintain the desired altitude as the airspeed increases. Prior to reaching the cruise airspeed, the power must be reduced to avoid overshooting the desired speed. The amount of lead time that is required depends on the speed at which the aircraft accelerates. Utilization of the airspeed trend indicator can assist by showing how quickly the aircraft will arrive at the desired speed. To level off at climbing airspeed, lower the nose to the appropriate pitch attitude for level flight with a simultaneous reduction in power to a setting that maintains the desired speed. With a coordinated reduction in pitch and power, there should be no change in the airspeed.